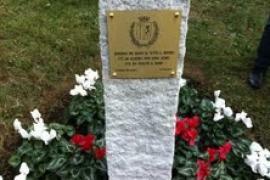 On 16th October 2011, the Garden of the Righteous of Cologno Monzese has been inaugurated inside the Park Aldo Moro. Nine trees have been planted in honor of the Righteous "of the past and the present, who assumed the great responsability to fight the Evil", as stated by Peace councilman Giovanni Cocciro. On the entrance of the Garden, a plaque has been placed with the inscription: "There is a tree for everyone who has chosen the Good". Buddhist monk from Tibet, he was kept prisoner and tortured for decades in Chinese "re-education" camps, because of his pacific support to Tibetan population and its rights. Activist of Saharawi human rights. Surgeon who provided medical assistance in the Vergarolla Massacre for over 48 hours, despite he had just lost his sons, brother, and sister-in-law. Italian Comboni missionary, martyr of justice and charity for his commitment in favour of local landowners and Suruí natives.